Even though the pride of Delhi – the elevated Metro tracks seem to find no takers. Earlier it was the Metro next to the Qutab Minar, now it is the elevated Metro line coming up in the residential areas of South Delhi that is being opposed. While the Qutab line (that would take Metro to Gurgaon) was taken about half-a-kilometer away from the monument, the residents of South Delhi want the Metro to stay underground even after the railway line at Defence Colony from where it is slated to move out. Residents fear that the elevated track will commercialize the area, eat into the green cover and make the area unsuitable for residential purpose. People objecting to the Delhi Metro’s elevated corridor in South Delhi have asked the Delhi Government as to why can’t the Metro remain underground, as it would from Central Secretariat till Defence Colony while passing through the VIP areas and the Lutyen’s Zone. A meeting was held at the Delhi Secretariat yesterday (May 25th, 2007) discussing the feasibility of keeping the Metro underground. NextSaving 40,00 trees/year – A Dept of Environment, Delhi Govt. initiative! 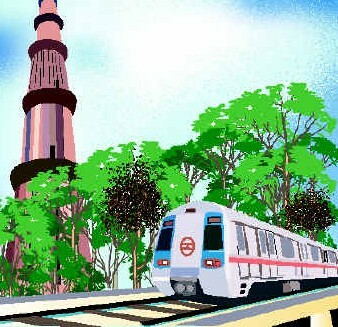 The elevated metro will be an eye sore in south delhi – which will especially spoil the evenings in the area. The elevated metro tracks are an eye sore everywhere but needed to sustain the project…it is not fair for any area of the city to selfishly expect the tracks to be underground just for it. It is sad that the so called educated elite of south delhi cannot see beyond their own petty selfish needs. The debate is an interesting one…looking deeper…it reminds me of the north-“south” divide that was a topic of heated debate in early 90s.